John has been unrelentingly taking the piss for a week about this, spouting all sorts, from tongue of newt to muggle-born, so you may as well join in. Eight days ago, the English sun was pouring unwontedly generously out of the blue sky, and John, Harry and I were playing in one of our local children’s parks. 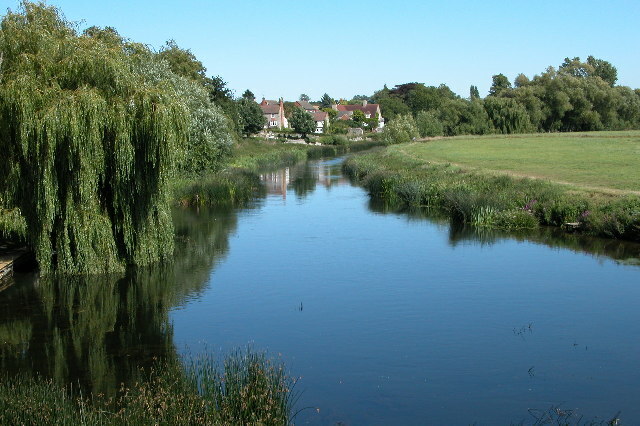 A particularly nice one, this, alongside a pretty village, set in the huge meadows right on the the banks of the River Avon. There is a well fenced-off playground section which Harry highly approves of. While he was scurrying frantically from playframe to slide, bouncer to swing, trying to do everything all at once, I saw a slim young girl with pale skin. I would, if cornered in the witness box, put her age at a tall 9. In actual fact, I feel she could have been… any age. Absolutely any age at all. She wore white leggings with a lace trim, a blue and white t-shirt in horizontal thin stripes, and a white headscarf holding back a mass of long, straight dark hair. She glided across my path on her long legs and folded herself elegantly into the spinning cup; she span round smoothly, head cocked into the small portable radio she was holding close in to her ear; all contained, seemingly, in her own existential bubble. Something about her was jabbing me right in my forebrain and my hindbrain was hitting what passes for my forebrain with a large metal club. I felt compelled to keep watching her; inexorably drawn to her without knowing why in the slightest. Then, she lifted her head and I saw that her irises were… black. Absolutely black. Seen from the side, there was no white visible at all. It wasn’t aniridia; it was simply a black emptiness in a pale ivory face. I can’t describe that face to you, other than to say than she looked ordinary and yet remarkable, because her exact features keep sliding out of my memory. I find this exceptionally odd, considering I was so completely transfixed by her. I drifted after her as she moved rapidly around the playground, trying not to make my interest in her too obvious, but so wholly hypnotised that I was in real danger of tripping over toddlers. She spoke to no-one and seemed to be there alone. Disbelievingly, I saw no-one turn their head in her direction – not even when she passed them close. No-one whose antenna were screaming like mine. No-one receiving on that frequency. I began to doubt my sanity. I am fairly well-regarded in re my sanity, incidentally. While she was intent on driving herself into the skies on the swings, I turned to look for John and Harry and scurried over, even less articulate than usual. ‘Look! That girl! Over there! Extraordinary! Look! She’s got absolutely black eyes – go have a look at her! John glanced vaguely at her, but we were side-on to the swings and Harry chose that exact moment to attempt an ascent route particularly challenging to one of his stature. I suppose it was a minute by the time he’d reached a safe platform and the maternal uneasiness subsided. Maybe two minutes, tops, and I was looking in the direction of the main river-facing gate out of the park all the time. You see where this going, don’t you? When I looked around again, with the firm intention of dragging John directly across her bows so that he could see The Eyes properly… she’d disappeared. That very hackneyed Vanished Into Thin Air trick. 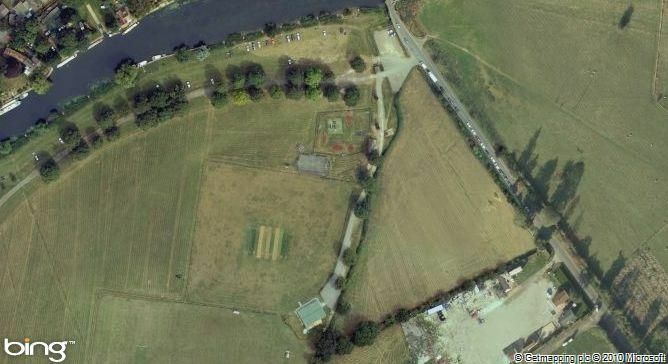 The Park is bordered by the river Avon, a toilet block, a car park, a road, a wire-fenced basketball court, and quarter of a mile of dead flat mown grass. There’s a few trees and cars, but the only thing really blocking the view in any direction is the toilet block. 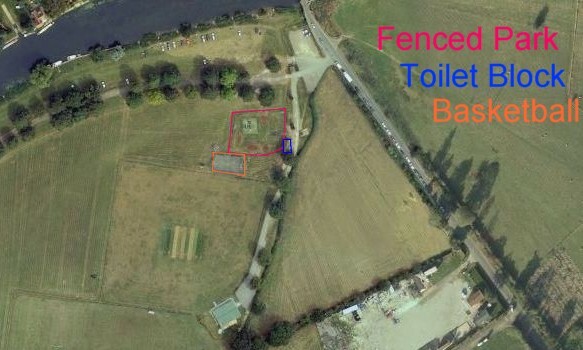 There’s a second gate out of the park by the basketball court, but it points toward the cricket pitch – not renowned for its hilly features. To move out of sight in the time I’d had my eyes off her, she would have had to A) head for the road hedge – straight past my eyeline and B) move like that Bolt chappie. I looked for her. With John cackling like a black and midnight bloody hag himself, and enduring his execrable jokes about broomsticks, I scanned the river. I looked around behind the toilet block. I peered behind trees and parked cars on the meadows. Eventually, admitting defeat, I walked over the ancient bridge, where 4ft of clear Avon flowed underneath, towards the village. We could clearly see shoals of beautiful fish, some 18 inches long, swimming among the weeds. Harry was delighted; the sun was still shining; we were out together as a family; it was a good day. But not an average day. The hairs on the back of my neck still stand rigidly on end when I think about her. And I will always wonder just who and what the bloody hell she was. Doo doo doo doo dooooh. Which will seem odd if you don’t know the x-files. God, I used to really fancy Mulder. We all get older, I suppose. The sexual tension between that pair was awesome! I was ACHING for them to just DO it… and as soon as the topic was broached, I completely lost interest and never watched it again! Tip to scriptwriters: keep ’em chaste. Horrible tangent here, but have you seen the last movie? They are hard at it. Yes, the child, William was his. I’m officially a fishwife now. Camera phone! That’s why you need a camera phone! I would have used it, had she not buggered off into the ether! oooo. Have you read any of Sarah Rees Brennan’s ‘urban fantasy’ books? In them only demons have all-black eyes. This one will sit with me for days. Not inclined to believe in things that go bump in the night, but then you don’t seem so, either; what a bizarre experience. Have you googled black eyed kids (BEKs)? Apparently other people have seen them too. Wowzer. Didn’t realise they were a global phenomenon! I had no actual fear of her, I have to say, although my mind flew immediately to John Wyndham’s Midwich Cuckoos – filmed as Village of the Damned. Hair-standing and shivers isn’t fear… is it? Midwich Cuckoo was my immediate thought as well. Meant to discuss this with you in person but cake was much more interesting on the day! It’s uncanny! Shivers! A real black-eyed kid. MAN. I just googled, and it was QUITE an eye-opener. Yikes! Course I am the person that is afraid to trim the hawthorn just in case the fairies get annoyed. I find it easier to believe she was an apparition than to believe that a child in this age of the i-pod would be holding a small portable radio up to her ear. Abso-bloody-lutely. That was strange heaped upon peculiar. Blimey. I am thoroughly unnerved, now. Also, madly plotting a supernatural story about BEKs now. Spooky! I got a shiver up my back as I read that…. Not about black eyed kids but pretty pertinent to your biological situation. Certainly have! Or, at least, am well aware of the lady in question. Apparently, the Daily Mail carried the story last week, which is how I found out how many of my friends read the awful thing! ‘Can you be pregnant in both at once’ is the first question EVERYONE asks – Hoo Boy, Yes You Can, is the answer http://news.bbc.co.uk/1/hi/health/6199363.stm – and quite a few follow that up with a question re: gestational timings. I suspect this particular girl produced an egg from each ovary a day or so apart, and they fertilised and implanted a further day or so apart. It is, seemingly, perfectly possible to continue to ovulate during pregnancy – although pregnancy hormones theoretically dictate against – and conceive in your OTHER uterus whilst already some months gravid in the first. There’s only 70-odd reported cases of at-least-one-monthly-cycle far-spaced twin pregnancies, none of them recent to my knowledge; although the Mullerian Anomalies support group http://health.groups.yahoo.com/group/MullerianAnomalies/ are the ladies with the Smarts in this area. Feel slightly less ashamed that I saw the article in the Daily Torygraph rather than … spit … The Mail. A broadsheet! You may hold your head high! Oooooo . . . tooootally X-Files! An infected host! RUN!